Slate flooring can be durable, naturally slip-resistant and hard wearing. 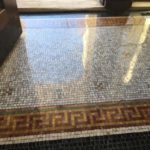 This makes it a great choice of floor tile that can be used in wet or high traffic areas. 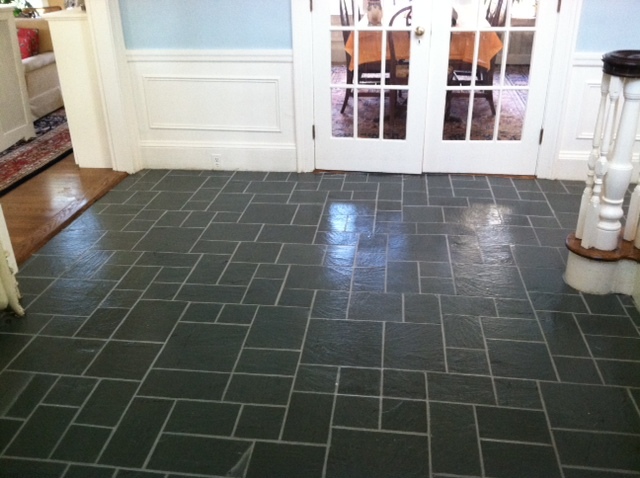 Slate floor tiles are often used in foyers, kitchens, porches and bathrooms. We have had several clients that have hired us to restore flagstone and slate flooring on sun porches so they can add heat and use them all year round. Flagstone is a beautiful and when treated with the correct coating, the natural beauty really comes out. 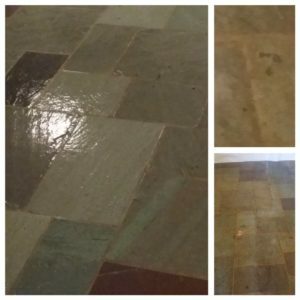 Here is an example of a floor that we applied a color enhancing coating to, bringing out the natural luster of the stone. 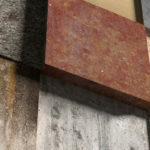 Flagstone is usually a form of a sandstone composed of feldspar and quartz . The material that binds flagstone is usually composed of silica, calcite, or iron oxide. Sealing flagstone is often a big question and we can help you decide how best to approach your project. For your flagstone sealing and other stone polishing projects, call Boston Stone Restoration today! 781-793-0700 or online.